We've been to San Diego Comic Con International 17 times, once to NYCC, and one time to TCAF (ok, it's in Canada, but it's awesome). Although we've been to conventions all around the world, in the United States we've been to only two. So we're really happy to be going to Denver and Phoenix the next two weekends. 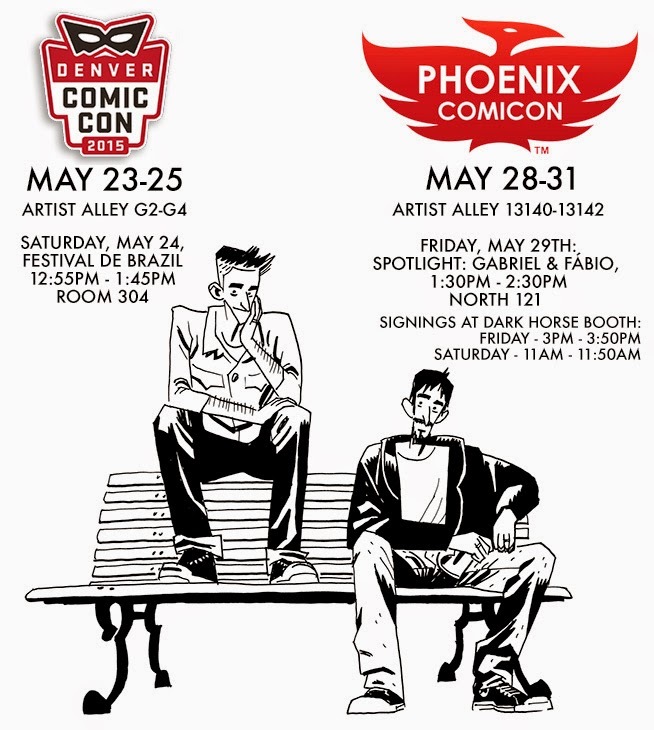 At the Denver Comic Con, we'll have tables G2 and G4 on the Artists' Alley, where we'll be most of the time. We'll sign books, make free sketches. We'll have comics and prints to sell. Stop by. On Saturday, May 24, from 12:55pm to 1:45pm, we'll be on Room 304 on the panel Festival de Brazil, with our friend Rafael Albuquerque. Then on the next weekend we'll head to Phoenix Comicon, where we'll set up our stuff on tables 13140 and 13142 on the Artits' Alley. If we still have comics and prints, we'll be selling them. If not, signing, sketching and talking comics. On Friday, May 29th, we'll be on room North 121 for a Spotlight panel about our work, from 1:30pm to 2:30pm. And we have two signings at the Dark Horse booth. On Friday at 3pm, and on Saturday at 11am. We're really excited to go to these two different places and meet new readers and creators. I just read the two first volumes of “Last Man”, the incredible action comic by french authors Bastien Vivès, Michael Sanlaville and Balak, published by First Second. Each book is around 200 pages, but I read it in one sitting 'cause I just couldn’t put it down. It was such a refreshing take on an action and adventure story, with a great cast of original and captivating characters. And it’s such a funny book. At certain scenes I had to put the book down to catch my breath because I was laughing out loud. I haven’t laughed this hard while reading a comic since Jeff Smith’s Bone was coming out on a monthly basis.